Nope, The Black Wizards aren’t characters from Dungeons and Dragons but a foursome who know that long, fuzzy songs are a thing of beauty. The band are built around the vocals of Joana Brito, and both her tones and the multiple guitars invoke the heady days of 1970s heavy psych and classic rock. Their first album was Lake of Fire, a title reflecting the mysticism within, and their second was What The Fuzz… yep, there’s plenty of that too. We’ve not done the maths, just a quick go in our heads, but the average track length on Fuzz must be eight minutes. Or you could spend fifty four glorious minutes with them in Lisbon in 2015. 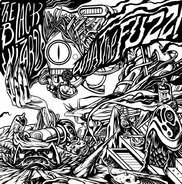 The Black Wizards are playing the Black Deer Festival in the UK this summer.